The Search for a Standard National Language: The Case of Flanders - Harold Tor. There has been a lot of talk about the Dutch language in Flanders in the past month. It happened when Dutch linguist Marc van Oostendorp made a sensational claim that, looking at the “growing differences” between the Dutch spoken in Flanders and that spoken in the Netherlands, the Flemish will speak a sort of language that strongly resembles West Flemish within the next two hundred years. The remark sparked an uproar from both sides of the Scheldt river, and interestingly, also from the West Flemish themselves. 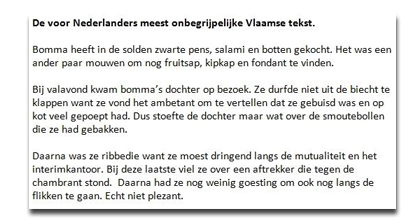 What is poignant about van Oostendorp’s remark is his premise that there are “growing differences” between the standard Dutch languages spoken by the Dutch and the Flemish. Unlike what most foreigners presume, the differences between the two Dutches are not merely a matter of accents. There are, according to many Flemish, many particularities in the Belgian version. For the second time round, TV presenter Pieter Embrechts made a programme called Man Over Woord on state television Canvas specifically to discuss the mastery of the Dutch language by Belgians. Centre-Right newspaper De Standaard also did a special daily edition on the Dutch language throughout the second last week of November 2012. What is apparent from the different media reports is the difficulties Dutch-speaking Belgians face in accepting standard Dutch as their own standard national language. In the survey conducted by De Standaard newspaper, as many as three-quarters of the respondents made a simple “-dt fault” in conjugation. This essay aims to explore this very phenomenon of the search for a standard national language in Flanders, Belgium. To kickstart our discussion, we first go back to exploring the very origins of a standard national language. Many people may not realise that the standard national language has not always been a standard. The standard national languages that we know today, have largely been the product of nation-building efforts that were taking place for the past hundred years. German is originally High German spoken in the southern parts of today’s Germany and it was “standardized” through the efforts of writers such as Goethe and Schiller. Italian is likewise a construction based on the works of Dante, who collected (according to his own opinion) the most beautiful words of all the descendants of Latin in the peninsula. Mandarin Chinese, was based on the dialect spoken in Beijing and imposed upon the Middle Kingdom by its new foreign rulers, the Manchurian. One, the power of the printed word. It is true that the Chinese invented printing but it was in western Europe that printing really brought about the information revolution. This has much to do with the difference between the pictogram-based written word and the alphabet-based written word. In this very instance of information diffusion, the advantage of alphabet-based written words is to allow someone with basic knowledge of all the letters to easily figure out the meaning of a word by simply reading it out. Printing and the possibility to diffuse information quickly sparked off the first revolution in western Europe: the rise of Protestantism. Protestantism has its origins in the possibility for everyone to read the Bible, a privilege formerly reserved for a selected few. Because information is power, people no longer accepted a top-down diffusion of information, but wanted to have their own opinion instead. Thus in Protestant countries, such as England, the Netherlands and Germany, the rise of the standard national language has had strong support in the broad readership that Protestantism encourages: the basic ability to read the Bible yourself instead of having it read to you by the priest. But naturally, this was not the only impetus for the rise of the standard national language. Two, the rise of public education. As was mentioned earlier, the possibility of the diffusion of information led to the rise of a new literate class. But the Industrial Revolution was really the driving force behind the rise of public education: it changed the society by transforming the modes of production. Urbanisation took place and trade boomed. To ensure production, sale and other economic processes run smoothly, people needed to be educated to understand what they needed to do as well as be able to teach other people how to do it. It was also during this period that nation-states started to assert themselves. Apart from compulsory military service, public education was a very useful means of building a national identity. In France, school children were taught about the “civilisation française” and that they are the heirs to the language of literary giants like Racine and Molière. Regional languages such as Catalàn, Breton, Alsatian German and Flemish were reduced to the status of “patois”. Three, the rise of the means of transport. The need to transport mass-produced goods and raw material such as coal and wood led to the invention of the railway. It is the railway that gave the nation-state its physical dimension: when a nation (a ‘race’) fully occupies and owns a ‘state’ (a piece of land with well-defined boundaries). The freedom of movement within this physical space also brought about the need for people within the space to fully understand one another. Public education ensures that the standard national language is the accepted form of lingua franca (the others were to be explicitly frowned upon) for the economic, social and political benefits of this new modern political entity. The invention of the automobile in the last century further enhanced this process. Lastly, the rise of the middle class. The power of the pen is indeed not to be undermined. From the invention of the printing press to the heights of the Industrial Revolution, the most remarkable human societal development took place in western Europe: the rise of the middle class. For the first time ever, in the history of the world (that is known to us), such a large percentage of a given society reached a relatively-high economic, social and literacy status, so much that they form the majority of that society. Apart from being affluent, the middle class benefits greatly from the national standard language and they seek to promote it. It represents their newfound (higher) economic status. It lends them the idea that they are heirs to great literary works in that language, and therefore the social prestige that comes with it. It also ensures that their offspring will continue to benefit from this status through public education. To maintain what they now had, the middle class invented democracy. Democracy ensures that the majority (which is themselves) has the ultimate say in how to run the country. Democracy enshrines all the ideals of the middle class: public education, public services and utilities, public transport, the freedom of speech (so as to challenge the minority upper class) and the freedom to trade (in the form of capitalism). Democracy is a system that locks the society in continually servicing the middle class, which is why democracy as a political system will never work in a country without a middle class, such examples are abound. When we take the four elements listed above regarding the rise of the standard national language, we can see why the idea of a standard national language does not quite fit the case of Flanders. The Reformation and the Counter-Reformation were what really split the Low Countries (then the Duchy of Burgundy) into two. The so-called “Spanish Fury” was the bloody rampages that the Roman Catholic Habsburg rulers conducted to weed out Protestants throughout the decade of the 1570s. This led to the “Dutch Revolt” in 1579 where the seventeen Protestant provinces in the north broke away to form the United Provinces of the Netherlands. These provinces became today’s Netherlands and the provinces that remained in Habsburg hands became Belgium. But things were not so simple. As explained above, the new middle class of the Industrial Revolution had its roots in the new literary class in the times of the Reformation. The people who fled to the north were not only Protestants, they were traders, artists, writers, thinkers – basically, intelligentsia. The people who remained were either illiterate or the literate minority loyal to the Habsburg Crown or the Church. 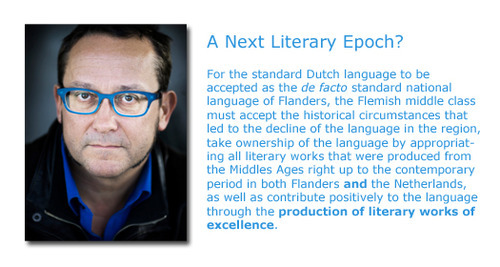 This implies that Belgium/Flanders missed its first opportunity to form a standard national language, when its entire literate class broke away and this locked the society in the feudal format for the next three hundred years. The language spoken in the Low Countries in the 16th century was Low Franconian called “Nederduits”. The current term “Nederlands” (Dutch) is a modern construction invented late in the 19th century as part of the nation-building efforts of the Netherlands. The linguistic region of Low Franconian was very big, stretching from the north of France in the south, to the east in the northwestern regions of today’s Germany. The centre of the language region, where the first literary works were produced, lay in the provinces of Brabant, Flanders and Limburg which are exactly today’s Belgium. 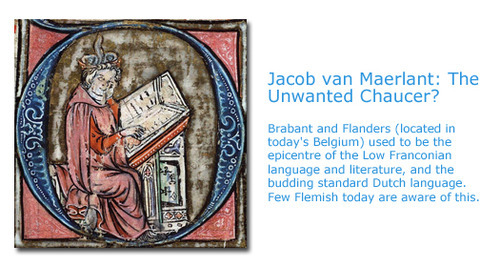 The early literary pioneers, Henric van Veldeke (1150 – 1184), Beatrijs van Nazareth (1200 – 1268), Jacob van Maerlant (1235 – 1300) and the Brussels friar Jan van Ruusbroec (1293 – 1381), were all from the southern provinces. Right up to the Reformation, Brabant was the centre of the budding Dutch language: Philips of Marnix the probable author of the Netherlands’ national anthem was born in Brussels. Anna Bijns, the first Dutch feminist and female poet was born and died in Antwerp. Almost immediately after the Spanish Fury, the centre of Dutch literature and language shifted to the north. The Renaissance was the Golden Age for the standard Dutch language (1550–1670). A gathering of humanistic thinkers formed the “Muiderkring” at the castle of Muiden near Amsterdam. Led by the poet Pieter Corneliszoon Hooft, its members included Constantijn Huygens, Dirck Sweelinck, Vondel, Bredero and the poetess sisters Anna Visscher and Maria Tesselschade Visscher. Henceforth, nothing was produced in Belgium between 1570 and mid-1800s. To stem out any further opposition to their rule, the Habsburg rulers reinforced French as the language of education, administration and therefore, prestige. This created the dichotomy that remains in Flanders today: the rich speaks French while the poor speaks Dutch. But what kind of Dutch? Without access to the written word, the Dutch language lived on in the southern provinces as the language of farmers and the lower classes. Stark regional differences continue (unlike the case of the northern provinces) because of the lack of the circulation of a standard form. To say that Belgium did not have a middle class was only half correct. The Dutch-speaking north (called ‘Flanders’ today which actually refer to Brabant and Limburg as well) was impoverished and became a largely agricultural economy. The southern regions – today’s ‘Wallonia’ – thrived. Industrial revolution took here like a storm, due very much to the availability of coal in these mountainous regions. The middle class that subsequently formed, considered French as their standard national language. Public education was in French, not Dutch. Current Flemish nationalists portray this phenomenon along racial lines, which was completely untrue: it was a natural progression from the promotion of French by the Habsburgs to the Industrial Revolution that the French language was considered a standard national language throughout the whole of Belgium. At that point of time in history, French was looked upon as a neutral language: it was not the mother tongue of the Dutch-speakers nor that of the Walloons. It was the language of the ruling class, much like how Latin was throughout the Roman Empire. In any case, this meant that the new middle class, in order to assert its newfound status took to French as a status symbol. All middle class (and the traditional ruling class) spoke French, regardless whether they were racially Dutch or Walloon. Brussels, being the seat of power and despite being located in the heart of Brabant, had therefore a large majority of French speakers. Without the support of the middle class, how then did Dutch reassert itself as the standard national language of Flanders? The ‘Flemish Movement’ (Vlaamse Beweging) (2) was originally an idea of a few French-speaking Flemish intellectuals living in the Dutch-speaking region, notably Jan-Frans Willems (1793-1846) of Ghent. The movement aimed to seek self-determination for the Dutch-speaking population through the usage of the Dutch language in judicial and administrative processes, as well as in primary education. A petition was drafted in 1840, but only 13,000 signatures were obtained. This was a predictable result back then: First, because the illiterate lower class who would benefit from the petition obviously could not read and support it; Second, because the budding middle class did not want to promote Dutch as this would challenge the status of French – the symbol of their current prestige – as the standard national language. The flight of the intelligentsia to the north after the Spanish Fury led to a collapse of the literary Dutch language in the south. The language only lived on in oral tradition among the lower classes. To find a national standard that everyone can understand, speak and write, is thus the first challenge. Priest-poet Guido Gezelle (1830-1899) wrote entirely in the dialect of West-Flemish, which according to him, is the purest form of Dutch due to the abundance of antiquated medieval elements (4). Jan-Frans Willems (1793-1846) the father of the Flemish Movement wanted to create a new standard national language out of the various forms of Dutch spoken in Belgium and the one spoken in the Netherlands. To find out what form of Dutch should be the standard national language, the first Netherlandish Language and Literature Congress was held in 1849 by the ‘learned’ of both the Netherlands and Belgium. It was not until 1946 that the first Cultural Treaty was drawn up between the two countries where such a collaboration was officially recognised. After centuries of misnomer, the language that is to be the standard national language of the Dutch-speaking Flanders is finally recognised as ‘Nederlands‘ (Dutch), not ‘Vlaams‘ (Flemish), through a decree of 10 December 1973. This implies that both Flanders and the Netherlands now belong to the same language region. 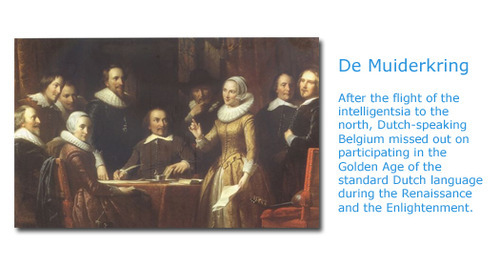 Both parties signed the Treaty of the Dutch Language Union in 1980 to seal this collaboration. So, the short reponse to both Gezelle and Willems: it is the form that developed in the north that has become the standard national language in the south. Or has it? Before we examine the above question, let us look at the situation in the southern parts of Belgium. Compared to its Dutch-speaking neighbours, French-speaking Walloons had and have no problems perceiving French as their standard national language. Like the plethora of dialects in the north, Wallonia has never been linguistically homogenous as it portrays itself to be. First of all, Walloon is not ‘a’ language. Contrary to claims that it is a dialect of standard French, the so-called Walloon are actually groups of languages unrelated to French, unlike the relationship between the various dialects of Dutch and standard literary Dutch. In the west of Wallonia, Picard is spoken like in Picardy in the north of France. In the centre is proper Walloon (‘Walon’) but the Walloon spoken in Namur is completely unintelligible to the Walloon in Liège, which is why the Namur-centred Walloon is called “Namurois” whilst the Liège-centred Walloon is called “Liégois”. Further to the south in Bastogne, the Walloon there is called “Walo-Lorrain” and further south, proper Lorrain is spoken like in Lorraine, France. But why does French go unchallenged as the standard national language? First of all, French, like the various Romance languages spoken in Wallonia is descended from vulgar Latin. It is easier for an illiterate Walloon to pick up French than for a Germanic Dutch-speaking person. More importantly, unlike its northern counterpart, there has never been a break in the use of French in Wallonia throughout the period from the invention of printing to the rise of the middle class during the Industrial Revolution. Coming back to the situation of standard Dutch in Flanders, despite having achieved linguistic self-determination, Dutch-speaking Belgians still have issues accepting it, paradoxically. Why? In spite of the different language laws put in place to promote standard Dutch as the new standard national language for Flanders, no one really speaks it. Efforts were put in public education, newspapers and radio to promote the use of the “Algemeen Beschaafd Nederlands” (awkwardly translated as “General Civilised Dutch”). The advent of television helped: In the 1970s, Professor Joos Florquin hosted a show called “Hier spreekt men Nederlands” (‘Here one speaks Dutch’) to teach the Flemish how to speak “civilised” Dutch. Up until today, the Flemish find standard Dutch artificial, awkward and unnatural. It is a language used on television and no Dutch is heard in any real-life situation. But most importantly, the point of self-determination was precisely to differentiate oneself as a separate nation, not to be melded into another one. Speaking Dutch is almost like a betrayal of one’s national identity of being a Flemish. So the Flemish try their best NOT to speak standard Dutch. It is almost comical watching the Flemish speak (broken) French or dialects to one another whenever they are in contact with the Dutch, so as to accentuate their separate national identity. This happens regularly in jointly-organised reality TV programmes. In their daily life, the Flemish have also started calling the standard Dutch language ‘Flemish’ and not ‘Dutch’, contrary to the 1973 Decree. Ironically, there is actually no such thing as ‘Flemish’, because everyone speaks their own version by mixing their local dialect with standard Dutch to form an off-standard variant. As explained in the first part of this essay, a standard national language will only take off when the middle class speaks it. The problem for Flanders, is that the upper and previous middle class (from the Industrial Revolution) spoke French. In the last sixty years, Flanders rose in economic prowess while Wallonia dwindled. In the postwar years, heavy industries such as mining fell in importance. Germany slowly became the economic powerhouse of Europe, the Netherlands as a trading partner of Germany and a former colony power also got richer. Flanders, sharing the same language as the Netherlands, likewise took flight. This might also be due to its lack of cultural hang-ups (unlike in Wallonia) to adopt English as the new international lingua franca for trade. So, a new middle class was born in Flanders. The problem for this new middle class is that it has no precedents that recognize Dutch as a language of prestige. The newly-rich do not have a role model for using Dutch as a language spoken by a pre-existing privileged group. This is the reason why many Flemish take to speaking French whenever they are in contact with French-speaking countrymen, as a sign of being “parvenu” or having made it in life. The last obstacle Dutch faces in establishing itself as the standard national language of Flanders is the idea of cultural heritage. In an effort to bridge the idea of not betraying one’s roots and having to adopt standard Dutch, the media started using something called “tussentaal”. Actors, comedians, presenters would colour their standard Dutch with (their own) regional dialects, ranging from speaking with a dialectal intonation, littering local words in their language, to deliberately pronouncing standard Dutch words with a regional accent. All this to portray themselves as more endearing as opposed to being foreign or pretentious. The use of Dutch as a standard national language in Belgium has not followed the pattern seen in the other western European languages. As a result, its speakers have difficulties accepting it. Various attempts have been made to “naturalise” the language to make it seem less foreign while ensuring that all its speakers understand it, all the more exhibiting that the Flemish lack cultural self-confidence regarding the use of standard Dutch and a sense of ownership of the language. Because of the break in the use of the written/literary form, plus the stark regional differences that have been culminating in the past four hundred years, there is no consensus on which regional colour the language should take on or whether this was necessary at all. Furthermore, the leading role of the middle class in the use and diffusion of the standard national language is essential. Without its support and if the middle class remains divided, it does seem like a long way before Dutch or a form of Dutch is accepted as the standard throughout Flanders. This refers to the countries on the “old” continents of Europe and Asia. Sub-Saharan Africa does not fit into this mode of development and neither do the countries in the Americas and Australasia. By now, the word ‘Flanders’ was loosely used to refer to the Dutch-speaking rural areas in the north of the country and the lower classes there spoke ‘Flemish’. This was much like how Holland is used to refer to the whole of Netherlands, except that in Belgium, this usage is now institutionalised. It is worth mentioning here that the first novel produced in the Dutch language in Belgium was the historical novel written by Hendrik Conscience in 1838 called “De Leeuw van Vlaanderen” (The Flemish Lion). Conscience’s father was French, and he kicked the young writer out of the house for writing in such a vulgar language. It was the Belgian king Leopold I who later commissioned Conscience to write The Flemish Lion, so as to inculcate nationalistic feelings for Belgium among the Dutch-speaking lower classes. The work remains a symbol of Flemish pride today despite serious historical inaccuracies: the main character Robert of Bethune certainly did not speak Dutch, and neither did his father, Guy de Dampierre, the Count of Flanders. To honour Conscience as a Flemish hero, his name was “dutchified” from the original French “Henri”. He was wrong. Some modern linguists suspect the peculiarities of West Flemish point to Saxon influences, which might infer that the Saxon invasion of Roman Britain also affected the coastal region of modern Belgium. A personal anecdote to illustrate this point: If one goes to any bookshop in Flanders today, one would notice there is a distinct lack of a ‘Classics’ section. 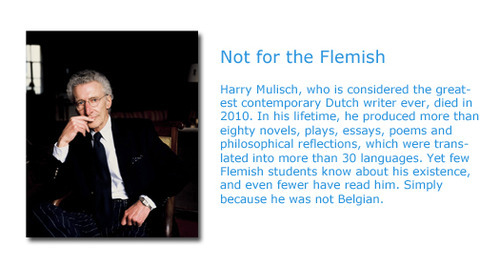 Literature, for the Flemish, only started in 1838 with Conscience’s “The Flemish Lion”. All works prior to that, such as the rich Renaissance prose and verse by Dutch writers, and even the local southern medieval writers, were conspicuously missing from the shelves. An explanation for this exclusion, apart from the obvious nationalistic sentiments, is the lack of continuous cultural heritage in Dutch literature that the northerners enjoy.